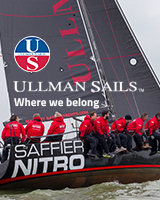 We are stoked to have Ullman Sails back onboard the good/bad ship USSR Sailing Anarchy! We are good friends with some of the Ullman team players, and think they do a great job in their various local areas. Ullman builds an incredibly diverse range of sails, and remain very strong in the dinghy and small boat market. And they have a ton of big boat success that tends to go unnoticed. And they build some pretty nice Flying Tiger sails! Give them a fresh look!